You depend on your geothermal system to keep your home comfortable all year long, which means there is never really a good time for something to go wrong. When your system does break down, you need repairs fast. And that is why Millie’s Heating & Air Conditioning is proud to offer comprehensive Arlington geothermal repair services to all of our area customers. We have worked extensively on geothermal systems, so even if we did not put yours in initially, we can handle all types of repair projects. Our technicians are well versed in this technology, and we make sure they have access to all of the proper tools and equipment at all times. Anytime you notice a change in the way your geothermal system is functioning, it is a good idea to have someone come out and take a look. You should call for professional Great Falls geothermal repair services if your system is suddenly not providing adequate or even heating or cooling, if it is making more noise than normal, or if it is using more energy to do the same amount of work. While it might be tempting to put off calling for repairs if the problem does not seem that serious, that is never a good idea. None of these issues, no matter how minor, will go away on their own, and waiting to get help only makes it more likely that the problem will get worse or that your system will break down completely. 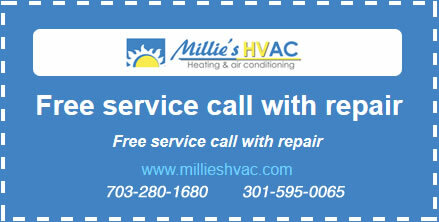 So whenever you notice a change or problem with the way your geothermal system is functioning, give Millie’s a call. We will have someone out quickly to take a look at the situation and make the necessary repairs. Our technicians know geothermal systems inside and out, and we will be glad to fix yours even if we did not install it to begin with. Even if you are not sure you need Arlington geothermal repairs, Millie’s experts are always available to answer questions and set up an appointment for service. We want to make sure your home is as comfortable as possible all year long, and this is just one more way we can do that.